Follow the guide to free download 75th Venice Film Festival 2018 videos HD MP4 like red-carpet, awards ceremony, nonimated/winner movies trailers online. The 75th Venice Film Festival (La Biennale di Venezia 2018) is scheduled to hit on 29 August and last to 8 September. American atress Annette Bening, was anounced as the Jury and also the first woman president since 2006. For someone who are seeking for a way to watch the 75th Venice Film Festival, we are glad to share how to free download Venice Film Festival 2018 videos (red-carpet, award ceremony, nonimated/winner movies trailers etc.) in HD MP4 using an online video downloader. Try to Free Download Venice Film Festival (2018) Videos for Offline Playback? Available to free download 720P/1080P HD MP4 Venice Film Festival (2018/17/16/15...) videos (award ceremony, trailers of all entered movies etc.) from 300+ sites hassle-free. There must be many brilliant moments of 2018 Venice Film Festival and precious festivals that we will never forget. If you would like to collect those moments, winners/nominees movies for editing, burning to DVD or getting a better offline playback, you may need to free download Venice Film Festival videos online. Of course, you can transfer videos to iPhone, iPad, Android, Windows devices and other devices during journey without worrying about expensive costs caused by a great number of traffics when watching La Biennale di Venezia videos online. 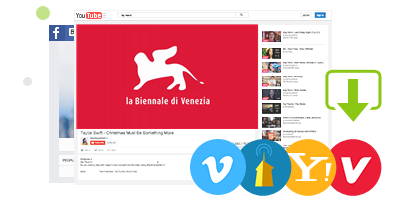 WinX YouTube Downloader, the best online videos downloader for Windows (10/8/7/XP), enables you to free download Venice Film Festival 2017 videos, movie trailers in SD, 720P/1080P HD MP4 from YouTube, Vimeo, Dailymotion, Metacafe, Yahoo! Screen and similar sites (300+ in total) as soon as possible. You can also determine to output other formats, WebM, FLV or 3GP of Venice Film Festival 2017 videos, As absolutely stand-alone software with no bundled adware, malware and spyware, WinX YouTube Downloader is not harmful to your computer at all. Step 1. Open WinX YouTube Downloader and click the link-shaped button on navigation bar. Step 2. Open YouTube and other supported sites. Search desired Venice Film Festival 2017 video. Copy and paste its URL to the address bar of pop-up window. Click Analyze button. Seconds later, the video info including title, duration and versions varying from resolution, format, size and code is listed. Select one version, for example 1920x1080 HD MP4, and click OK. Step 3. Click Browse button to set target folder if necessary. Now, click Download button to start downing Venice File Festival videos. Tip: The Green Convert video button next to Download allows you to get the best solution to convert the downloaded Venice Film Festival video to a desired format or device with ease. * Free download SD/HD/4K/8K videos of Venice Film Festival (2018) or other music/film festivals, movies, music, sports etc, from 300+ site in a flash.